Marvel Comics fans have often made fun of DC Comics' abundance of sidekicks and "kid" versions of characters. There's a simple reason for the differing traditions, though: in the early days of superhero comics in the 1940s, child sidekicks were believed to be both a way to help kids identify with the situations and the comics as well as give them a role model (Robin's early appearances in Batman comics featured numerous lectures about moral behavior). It was also a simpler time, when the audience of superhero comics was entirely adolescent children. Sidekicks made sense from a business standpoint, and the simple nature of the stories - busting gangsters and petty thugs, rather than world-devouring demigods - made having a sidekick less like reckless child endangerment and more like plain old adventure. By the 1960s, when Marvel Comics debuted, comics readers had matured through the era of EC's horror comics and so forth, and so the superheroes themselves became younger - Spider-Man and the X-Men were teenagers - while the stories became more complex and mature. At the same time, the 1960s Batman television series made sidekicks into walking punchlines thanks to Robin's campy portrayal. In what can only be described as lightning striking twice in the same place, Wally West gained the same incredible powers as his idol, the Flash. While visiting his uncle, Barry Allen, Wally was doused in electrified chemicals when lightning struck Allen's lab, a virtual replay of the accident that had imbued Allen with superspeed years earlier. Discovering that Allen and the Flash were one in the same, Wally was even more thrilled when he was given the opportunity to be the Scarlet Speedster's sidekick, Kid Flash. DC eventually responded to Marvel with series such as the New Teen Titans, which featured younger superheroes (including many sidekicks) fighting crime on their own while dealing with the timeless issues of being teenagers. Robin emerged from Batman's shadow and became Nightwing, and by the end of the 1980s, Wally West - a.k.a. Kid Flash - found the mantle of being the Flash thrust upon him when Barry Allen died during the Crisis on Infinite Earths. Kid Flash is an odd figure. There's no getting around that. For one thing, I think he's too small - this is a 12-year-old Kid Flash, not a 16-year-old. His physique is slender enough that the teenaged aspect is evident without having to make him a midget. I'm not sure whether the smaller size is the result of the Four Horsemen's sculpting or Mattel's production process, but judging from two-up photos and given Mattel's track record, I suspect it's the latter. Body aside, the head sculpt is great. Wally looks like a George Perez illustration come to life. His wavy red hair pokes out of the top of his mask, and he has the appropriate red antennae over his ears. Considering this is a child, the cut of his jaw is perhaps a bit too square, but I suppose some concessions must be made to account for the unreality of the general "heroic physique" all comic characters share. Unfortunately, the yellow plastic used to mold the majority of Kid Flash is not particularly forgiving. 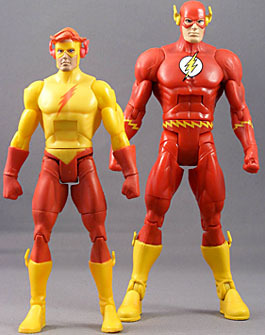 It has the same vague translucent quality that mars the bright red figures, and as a result, Wally ends up looking and feeling more like a plastic toy than most DCU figures. That aside, the paint applications on the head are good, with very little slop, and the tampographed chest symbol is sharp. The edges of the red paint around the pelvis are a bit uneven, however. 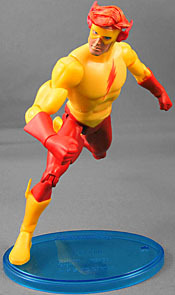 Kid Flash features the usual DCUC articulation: balljoints at the neck and shoulders, swivels at the waist, wrists, biceps and lower thighs, and hinges at the elbows, knees, ankles, and abdomen, with an H-hinge at the hips to allow for a balljoint-like range of motion. The balljointed neck on my figure is very stiff and doesn't allow for much movement, while the bonus rocker motion on the ankles is very good. 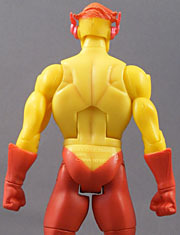 Kid Flash comes with his Atom Smasher part, and that's all. (It's the right arm, and it's nearly as tall as Wally.) 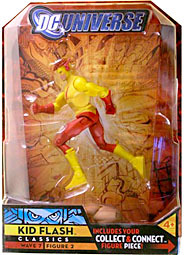 I'd also be remiss not to mention the packaging - while the general shape is, of course, the same as all other DC Universe packages, the tray which holds Kid Flash in place has been molded with a series of "speed lines" trailing away from the figure. That, coupled with Wally's running pose, creates a mini diorama before you even open the packaging. Consider it a bonus for MOCers, and something nice for the rest of us to enjoy before taking the plastic out to the curb for recycling. More than anything, the small size of this figure disappoints me. He looks a bit silly next to his Teen Titan teammate Cyborg (though he makes Starfire look like she's not the wrong size). Add to that the toy-ish look and feel of the plastic and you have one of the lesser DCU figures thus far. As a completist on this line, I would have bought him regardless of his Atom Smasher part, but begrudgingly.